The State of the Blogosphere Part 2 is now available and the graphs you see have a shape that is getting more common. Its not a bell curve but rather a curvy slide down with a long tail. This is because it follows a power law distribution which best portrays the kind of hierarchy we find in nature (yeast cells in a protein network) or in the blogosphere (BoingBoing’s vast readership vs. our sad puny blogs). Power laws don’t have a peak in the middle, like a bell curve. They start out high, then taper off gradually with a “long tail” that can often begin to rise again slightly due to a second wind or renewal of interest. Most organic systems AND internet based hierarchies are scale-free follow a power law distribution and display the signs of a modular hierarchy. And church planting movements once they are running freely, I expect, would also display power law characteristics. Hence, my interest. Albert-Laszlo Barabasi has some excellent thoughts on power laws and scale free networks in his book Linked. He says that by “viewing networks as dynamical systems that change continously through time, the scale free model embodies a new modeling philosophy” This philosohy, tied to network theory and complexity, involves a change of thinking from static to growing, from random to scale-free, and from structure to evolution. Power laws, says Barabasi, are “nature’s unmistakable sign that chaos is departing in favor of order . . they are the patent signatures of self-organization in complex systems”. Or in other words, emergent behavior. Power laws explain why BoingBoing.net can become so ridiculously bloated with permanent links and why our sad little blogs do not. Growth and preferential attachment, says Barabasi, are the two key factors. Because you already have lots of links, the search engine places you on top of the hierarchy for that particular search. Because you get placed higher, more people find you and more people read you and more people link to you and you get exponentially higher up the ladder of this new kind of hierarchy. Kinda reminds me of when Jesus said “To everyone that has, more will be given”. More on this and its relationship to giving here. Also, take a look at Dwight Friesen’s Scale-Free Networks as a Structural Hermeneutic for Relational Ecclesiology which not only outlines some good application to networks of churches [Christ-clusters] but its also great bedtime reading for your children. 1. What is the relation between the hierarchical modularity of a complex system and what is found within the triune complexity of the Godhead? 2. Can Elohim, the Triune God, be a model for a new kind of dynamic hierarchy? the reason you see a ‘long tail’ graph instead of a bell curve is that you’re graphing different information. the popularity graph that yeild the long tail (aymptotal) uses blogs as the independent variable (x-axis), and number of hits as the dependent (y-axis). a bell curve would result from using number of hits as the independent variable, and number of blogs as the dependent variable. example: very few blogs get as many hits as instapundit, or boingboing. some blogs get as many hits as brooklynvegan, bldgblog, (insert other leading ‘niche’ blogs). 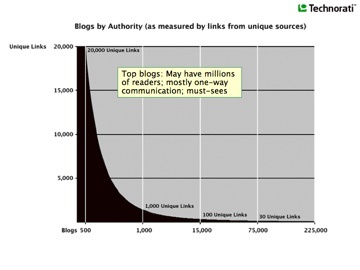 most blogs get as many hits as you or i. very few blogs get no hits (if you rule out splogs). Cool reads for the weekend…. Can you explain that again in ‘easy to understand terms’ … I think I understand what you’re saying, but not certain. Thanks. Previous Post (p)	My Blog's Family Tree - Yours? Next Post (n)	Blog Fast. Back 25th Feb.